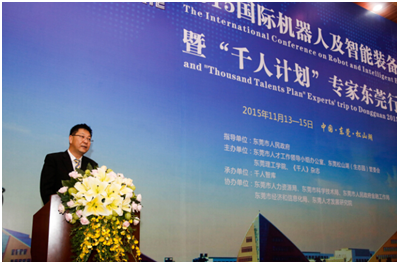 The WRIE 2015 & Dongguan Tour of Thousand Talents Program Experts were held in Songshan Lake Biopark on November 14. The events gathered experts and entrepreneurs in robot and bio-industry. Invited to the Summit were 150 domestic and foreign Thousand Talents Program Experts and other high-level talents. In addition to experts in robot, foreign experts also joined the event, including Paolo Bonato, director of Motion Analysis Lab at Spaulding Rehabilitation Hospital. Professor He Jiping of Neural Interface & Rehabilitation Technology Research Center, Huazhong University of Science and Technology, and Chairman & General Manager Zhao Wei of Anjin Medical Technology (Beijing) Co., Ltd., were the two experts that the Company received with other units. During the reception, the Company learned about the project information from the experts and introduced Songshan Lake and its entrepreneurial environment in the hope that the experts could consider unfolding their projects in Songshan Lake.